In a guest post this week on Justia’s Verdict blog, I explain how one can use citation format to determine a legal information service’s data source for case law and report on the results of such an investigation. The language is drawn directly from a 1984 publication of the U.S. Copyright Office, which has been under revision for over two years. As Malamud explained, the legal position it expresses traces back to two nineteenth century Supreme Court decisions, Wheaton v. Peters, 33 U.S. (8 Pet.) 591 (1834) and Banks v. Manchester, 128 U.S. 244 (1888), is grounded in Constitutional values, and despite the absence of explicit expression in the current Copyright Act has continued to be affirmed by twenty-first century rulings. See Veeck v. Southern Building Code Congress International, Inc., 293 F.3d 791 (5th Cir. 2002). The case he presented to Congress cited the experience his non-profit, Public.resource.org, has had with states’ claiming copyright in their codified statutes (the subject of a prior post). The principal target of his testimony and the proposed amendment, however, are copyright claims asserted by standards development bodies in the safety and other codes that are, as intended, adopted as law by state and federal governments. Testifying in opposition to the proposed amendment was the vice president and general counsel of the American National Standards Institute. Malamud’s testimony made no mention of his organization’s past work with case law and the cloud of copyright uncertainty overhanging law reports. Nor would his proposed amendment resolve a copyright issue that has been a major source of that uncertainty for nearly three decades. The issue first arose in 1985 when Lexis announced its intention to add volume and page numbers drawn from the National Reporter System of the then West Publishing Company to its database of federal and state judicial opinions, not merely the page numbers on which decisions began but the page-breaks within them necessary for pinpoint citation (“star pagination”). West sought and was granted a preliminary injunction on the ground that while the decisions issued by courts were in the public domain the selection and arrangement of them in West’s books as expressed in volume and page numbers qualified for a compilation copyright. West Pub. Co. v. Mead Data Cent., Inc., 616 F. Supp. 1571 (D. Minn. 1985), aff’d 799 F.2d 1219 (8th Cir. 1986). Three years later, the litigation was settled in an agreement that allowed Lexis to incorporate West page numbers in its online system upon payment of “substantial” license fees (reported to be $3 million a year). A Lexis spokesperson noted that although there was no definitive court ruling on the merits “contractually we are recognizing their copyright.” Since the license to Lexis was limited to the online service it constrained the company’s later initiatives in CD-ROM distribution. While a 1991 Supreme Court decision, Feist Publications, Inc. v. Rural Telephone Service Co., 499 U.S. 340 (1991) cast substantial doubt on the West copyright claim, the company continued to use it to beat back the flock of new entrants drawn to case reporting during the early 1990s by the low cost of CD-ROM publication. See Oasis Pub. Co. v. West Pub. Co., 924 F. Supp. 918 (D. Minn. 1996) (settled while on appeal, also with a West license affirming its copyright claim). In 1992 the Thomson Company, not yet owner of West or merged with Reuters, supported a bill introduced in Congress by Barney Frank (H.R. 4426, 102d Cong. (1992)) that would have specifically excluded copyright coverage of the names, numbers, and citations of state and federal statutes, regulations, and law reports. Fiercely opposed by West, the proposal failed to get beyond committee hearings. Charging money to small publishers for obtaining a license to use a pagination system to which any copyright claim seems questionable would impermissibly shift the costs of litigating the legal uncertainty of West’s copyright claim. December 31, 2000 came first and as of January 2014 the Supreme Court has not ruled. Thomson Reuters, now West’s owner, has yet to relinquish the claim that volume and page numbers drawn from its reports (the only accepted means of citing a passage within the opinions of a majority of U.S. jurisdictions) and inserted by others in public domain texts infringe its copyright. Malamud knows this well for in 2007 he wrote Thomson Reuters asking for clarification of the scope of its copyright claim in the National Reporter System. The reply by its deputy general counsel reasserted the company’s claim to a copyright in the “selection and arrangement, within each reporter, of the individual case reports.” His letter noted that the 1998 Second Circuit case, Matthew Bender & Co. v. West Pub. Co., 158 F. 3d 693 (2d Cir. 1998), holding that the insertion of the West star pagination was not an infringement of copyright, was decided 2-1 over a strong dissent and that the Eight Circuit had consistently held to the contrary. 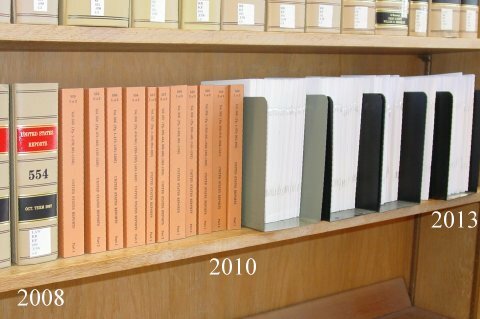 The Court of Appeals case law collection offered by Public.resource.org ends in 2007 and contains no West page-break data. See, e.g., Moore v. Quarterman, 491 F.3d 213 (5th Cir. 2007). The designations by which laws and judicial opinions are cited are so integrally connected with the texts they identify their copyright status ought to be addressed at the same time. All the reasons why copyright law should not be available for use by public bodies or commercial entities to restrict access to or republication of “edicts of government” apply equally to the data that identify them, whether volume and page numbers, title and section numbers, or more contemporary, medium-neutral citation schemes.